Are going to taster days worth it? What about one in podiatry?! Last Thursday, a group of 6th form students from West Sussex, visited University of Brighton Leaf Hospital for a taster day to understand what Podiatry is and whether it is something that they would consider as a career. It would appear that the common understanding of podiatry is that it’s all about ‘treating ingrown toe nails and bunions’. However judging by some of the feedback below, the 6th form student reactions were positively fantastic, and suggests that there is more to this subject than meets the eye! “I’ll be honest saying it’s the best taster I have done so far. The content was well chosen, as well as the subject discussed. I loved the clinical part, such a great experience that I will share with my peers. Your students make a big difference compared to the students I have met in the past. Thank you all”. “I heard about Podiatry before but I had little knowledge about it actually. It’s actually better than I thought it was, the sessions were pretty good”. Split into two groups, the 6th form group took part in a number of interactive sessions to see first-hand and gain a flavour of what ‘is’ involved in podiatry. First on the list was the University of Brighton Leaf Hospital NHS clinic. As the group went round the clinic and shadowed the 3rd year podiatry students, there were clear reactions of surprise that real life NHS patients were being treated. They were told that University of Brighton students that study a podiatry degree have numerous ‘in-house clinical placement’ opportunities at Leaf Hospital to ‘practice what they learn’, plus they get to undertake a further two x 3 week placements held externally at NHS Trusts. With this level of experience, it comes as no surprise that the University of Brighton are seen by many, as being ‘leaders in the field of podiatry’! The opportunity to have an in-house facility such as the Leaf Hospital is unique to University of Brighton. It ensures that podiatry students gain hands-on experience very early in their first year, whilst being supported by the close knit team of teaching staff that are always on hand to give their advice and guidance. In fact, students on the podiatry course will accumulate 1,000 hours of clinical practice giving essential experience of working with NHS patients and manage their own caseload before they quality as a podiatrist! As the 6th form group went round clinic, it was obvious that for the many patients being treated, they were more than happy for the podiatry students to practice what they have learnt. They were happy to chat and were full of praise about the levels of care and professionalism that they were receiving from the University’s podiatry students. So ‘is’ podiatry all about ‘treating ingrown toe nails and bunions’? Well it certainly is about some of that, but actually podiatrists are specialist health professionals who care for all kinds of patients with foot and lower limb complaints. They help patients maintain their health and wellbeing through a variety of podiatric treatment, including minor surgery, orthotics, exercise and education. A lot of the students commented that they were surprised at the wide range of ages and conditions of people being treated; from young children with foot development issues, to those with diabetes, to older people that may have circulation or arthritic conditions. “I feel I have a lot better understanding of the podiatry course and I really enjoyed talking to the students about their course and opportunities within the course”. Students were then taken to the Anatomy Lab to have a closer look at the anatomy. There was ample opportunity to ask a number of questions to develop their knowledge and understanding of the human body. For many who have studied biology, and who are interested in a career in health, it was an ideal opportunity to gain a greater understanding of the lower limbs, anatomy and physiology. “The day gave a good insight into an area where the students and I knew nothing of. Every session was paced correctly. Seeing the anatomy lab was excellent”. The third session helped guide students through the UCAS application process, and help them identify what admissions tutors are looking for when they are looking at applications. With guidance, students were able to look at their best qualities and skillset to identify how these skills can be best demonstrated in their personal statements. With this advice and guidance the students then worked through a personal statement workshop. “I loved the help with the personal statement and how to apply, as this has never been explained before”. The day ended with a fun, interactive, practical session by Graeme Hadlow, University of Brighton Podiatry Graduate and current Podiatry practitioner, who specialises in ‘Musculoskeletal’ areas such as joints, bones, tendons and nerves. He gave a general overview of podiatry and how podiatrists play a crucial role in caring for those with foot and lower limb complaints. With a few brave students taking their shoes and socks off to bare their feet for others to observe; students had the opportunity to carry out a couple of assessments, discuss symptoms, their effects and treatment! What seemed to strike a few of the students was the impact that podiatrists had on a patient’s over all wellbeing, incorporating emotional, physical, and practical considerations. Where patients may have underlying and complicated health issues, in extreme cases this can lead to severe pain, infection, circulation issues and lack of mobility. This lack of mobility can lead to lack of independence, low self-confidence and self-esteem, depression, and in some cases these issues can lead to loss of employment and therefore detrimental financial implications. Discussion was had around this and the impact that podiatrists have on their patient’s lives in helping prevent the above. They are there to treat the conditions, manage the pain, provide advice and with their empathetic approach help patients feel secure and cared for. So what are the career prospects for graduate podiatrists? With an ever increasing demand for podiatrists, which is partly due to an emphasis on health and fitness, an ageing population, and an increase of chronic diseases such as diabetes, there are plenty of opportunities for graduate podiatrists once they graduate. With opportunities within the NHS and in the private sector, there are lots of options to study further, specialise in certain areas, and set up their own business! For further information check out the Careers in Podiatry website here. So is it ‘one foot at a time’ or ‘leaps ahead’ for our 6th form students? From the feedback given, the 6th form students all agreed that prior to the taster day they did not about podiatry. However, all of those that had responded had strongly agreed that the taster day had given them a good understanding of podiatry, with over 50% saying that they would consider studying podiatry at University! So to summarise – if you are a naturally caring person, thinking about going to University and studying a professional career in health science, why not consider podiatry? The opportunities are there – it’s upto you to grab them! 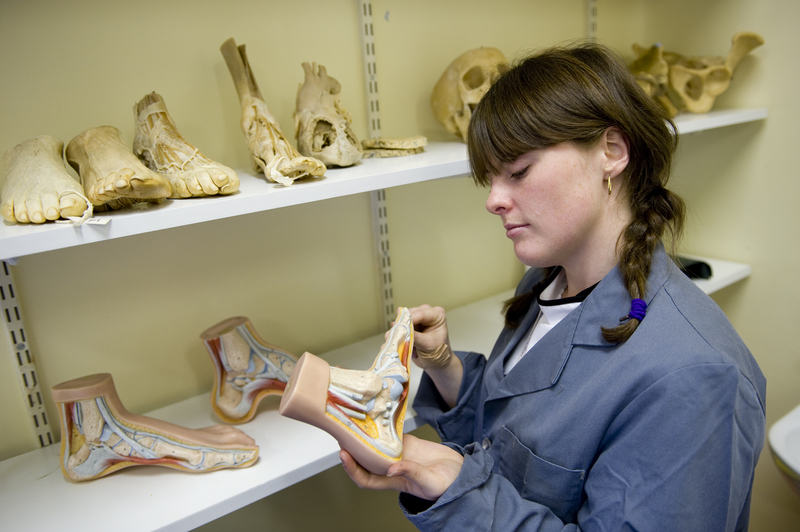 For further information on our degree in podiatry and how to apply click here. If you are interested in attending one of our podiatry taster sessions contact Vicky Johnson by e-mail on V.Johnson3@brighton.ac.uk. Tagged 6th Formers, BSc (Hons) Podiatry, Careers in Podiatry, Podiatry Taster, Practice Placement, University of Brighton, What happens at a podiatry taster?, What is a podiatry taster?, What is podiatry?. Bookmark the permalink.